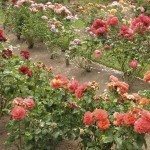 In this article, we will take a look at the fullness of blooms when it comes to rose bushes. One attribute of roses that is often not thought about is how big or full a rose blossom will be. Roses of varying fullness each have their own appeal, but knowing how full the rose you choose to grow will be means that you will have a better idea of what the rose blossoms on that rose bush will look like. The petal count of a particular rose bush bloom/flower is a measure of the fullness of that actual flower. The American Rose Society has come up with the following list to measure fullness of bloom based upon the petal count of the rose flower. Rose blooms typically range from a simple bloom of five petals to more than 100 petals within that single bloom! A bloom referred to as a Single will have 4 to 8 petals. A bloom referred to as Semi-Double will have 9 to 16 petals. A bloom referred to as Double will have 17 to 25 petals. A bloom referred to as Full will have 26 to 40 petals. A bloom referred to as Very Full will have 41 or more petals. When looking to buy a rose bush, many will have one of the bloom references noted above printed on the label as to the rose bush bloom form, thus helping to define what the customer may expect the blooms to be like on a particular rose bush.